Recently, at Costco, we ran across a case of an unusual-sounding drink: Golden Nest brand “Swallows Nest Beverage,” nestled right next to the Frappuccinos for the price of 8 bottles for $20. We thought the “nest” part was perhaps just a brand name or a metaphor, but it turns out that this drink is actually made from an edible bird’s nest, a prized culinary ingrediant in China. This ingrediant is more commonly known as “Edible bird’s nests,” and are actual bird nests created by varieties of swiftlet birds out of hardened saliva. Yep, you read that right. The nests are prized for their purported health benefits and contain a large amount of amino acids. Birds nests can go for hundreds or thousands of dollars per kilo, so a price of less than $3 per bottle seems quite reasonable! In 2018, the Mid-Autumn festival in China falls from September 24-26. One of the most traditional treats for Mid-Autumn festival is the mooncake, made of a glutinous rice flour skin filled with lotus paste and sometimes an egg yolk (to represent the moon). Though mooncakes may be the best-known Mid-Autumn festival food, we were looking for something a little different. That’s where Osmanthus comes in – a flowering blossom that is in season at this time of year. According to mythology, the Osmanthus tree grew on the moon. During the Mid-Autumn Festival, Osmanthus can be found in everything from Osmanthus tea (steeped with black or green tea leaves), to Osmanthus jelly, to Osmanthus Wine. Osmanthus has a unique flavor, and though it is related to the cinnamon tree, it also has fruity apricot notes. For a double whammy, you can even make Osmanthus-flavored mooncakes! We love the southeast Asian food in Cleveland (looking at you Superior Pho), but we are still on the lookout for our new favorite Chinese restaurant in the area. Fortunately, we have found a strong new contender in LJ Shanghai (3142 Superior Ave., Cleveland), which specializes in Shanghainese soups and Xiao Long Bao (XLB) aka soup dumplings. We had been craving soup dumplings and, up until this point, had not been able to find any in the area, so we were stoked! LJ Shanghai is located in AsiaTown, in a small, unassuming storefront. The inside is modern and bright, and you will know you are in the right place when you are greeted by the little dumpling mascots on the front window. The menu is at LJ Shanghai is relatively small, and we appreciate the curation because we are easily overwhelmed by long menus. Each menu item also has an included photo, which proved to be super helpful. You can start out with lighter bites like the the steamed pork buns ($5) or the garlic and cucumber. There are also hearty entrees like steamed chicken ($15) Braised duck with soy sauce ($10) and sweet and sour ribs ($10). However, we were here for the XLB, ($5 for 6 – seen above). The dumplings are steamed in a basket, during which time, the gelatinized broth melts, creating the desired ‘soup.’ The soup dumplings at LJ are very good, with a thin noodle skin and a tasty, pork filling surrounded by the mysteriously liquefied soup. The dumplings are accompanied by a variety of other dipping sauces (ginger, vinegar, chili sauce etc) to customize your experience. We have not quite mastered the technique of eating XLB elegantly, but we are looking forward to future attempts. Another standout on the menu is the soup, which is the perfect hardy antidote to the seemingly never-ending Cleveland winter (though Spring is starting to peek its head out…we think). Some soup options include beef and vermicelli curry soup ($8) Shanghai flat noodle soup ($8) and mixed veggie noodle soup ($10). We sampled both the Wonton soup ($6 without shrimp, $8 with shrimp) and the Chongquing spicy beef noodle soup ($10 with beef, also available without beef, or with pig intestines). The spicy beef soup was nicely spicy thanks to the chili flakes and oil, and as a result was extremely warming. We also appreciated the good cuts of beef, crunchy bok choy and a heavy helping of cilantro and peanuts. The wonton soup was its polar opposite, very light and almost delicate, with a clear broth, and we especially enjoyed the handmade pork wontons. Valentine’s Day is on the horizon, which led me to wondering – other than chocolate – are there really any desserts associated with Valentine’s Day (I couldn’t find any)? This search led me further afield to the intriguingly named “Wife Cake” (aka Sweetheart Cake). Wife cake is a traditional Chinese cake, made with a flaky pastry surrounding a sweet, candied winter melon center. I have seen a ton of different names for this same cake, but according to Wikipedia, the literal translation from the Cantonese lou po beng is “Old lady cake” with “old lady” being used in the sense of “wife” (get it!?). Winter melon (despite the name) is actually a squash and can be prepared in both sweet and savory ways. Candied winter melon alone is a popular snack around Lunar New Year and you should be able to find it in a well-stocked Asian grocery. Since these cake are filled with winter melon, it is no surprise that they are also particularly popular around Lunar New Year – which is coincidentally 2 days after Valentine’s Day in 2018. If you are looking for a treat to celebrate Valentine’s Day OR Lunar New Year, here are recipes for Wife Cake from My Kitchen Snippets, Gwai Shu Shu and More than bread. One of the most interesting articles we have read recently was about the prevalence of Russian Borscht in Hong Kong [via Metafilter]. The presence of a Russian soup in China (though it is made without beets there) starts to make a bit of sense when you think about the actually proximity of the two countries, but even more sense when you learn of all of the post-revolution White Russian émigrés who found their way to China and Hong Kong. These immigrants then started restaurants, and many of the Hong Kong’s top restaurants were owned by Russians by Mid-Century. Even though this wave of Russian immigration has ended, you can still find Borscht (called “loh sung tong” / “lor sung tong”) in Hong Kong. Cooking with Alison and Mrs. P’s Kitchen (seen below) have two classic Hong Kong Borscht recipes. Saturday is Chinese New Year – kicking off the year of the horse! 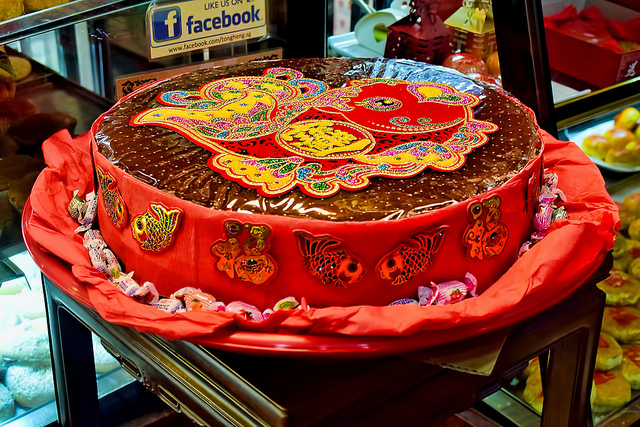 Chinese Fa Gao 发糕 aka “Prosperity Cake” is a delicious part of Chinese New Year festivities, and is said to bring good luck. So what makes this cake so “prosperous?” Turns out wordplay is part of it – “fa” means both “prosperity” and “raised.” The recipe for Fa Gao is super simple – and consists of not much more than sugar, rice flour, water and baking soda (hence the “raised”). The rice flour imparts a a more sticky, dense texture, which comes through during the steaming. The individually-sized cakes, baked in cupcake tins, have a distinctive split at the top. Even if they are not flavored, the cakes are often dyed in bright colors for the festive holiday. Check out the Fa Gao recipes from Kirbie Cravings, Random Cuisine and Yes to Cooking to add to your Lunar new Year Table. Koko Bakery (3710 Payne Ave, Cleveland, OH 44114) has a little something for everyone, and is a great place in to get your bubble tea fix, and follow it up with some egg tarts and sweet red bean buns. Koko Bakery reminds us of an amalgamation of some of our favorite spots in Chicago: combining the Chinese buns from Chiu Quon Bakery with the huge bubble tea menu of Saint’s Alp, all in a clean, simple cafe that has an almost-intimidating variety of treats (and free wifi). Along one side of the restaurant, there is a bakery case with all sorts of Chinese, Hong Kongese, and Taiwanese pastries, in both sweet and savory varieties – all you do is pick up a tray, and start using the tongs to pick out which items you want (most priced under $2). We tried the red bean bun, the Char Siu Bao (BBQ pork bun) and the egg tarts, and all were quite good (and super cheap). Other varieties of buns and pastries included bo lo (pineapple bun), taro, cream-filled, strawberry, peanut butter, scallion, cheese, beef, chocolate and coconut. Koko also has frozen buns to take and bake, sweet cakes in flavors like Ube and green tea, and a second bakery case filled with Asian and European inspired petit fours: from mango and chocolate mousses to mooncakes to mini cheesecakes. It seems like pretty much every surface of this modest store is covered in baked goods, and on the right side, you will find other non-refrigerated sweets like sesame cookies and loaves of milk bread. The bubble tea menu is also massive! You can get all different varieties, from iced fruit smoothies to sweetened coffee to the Hong Kong style milk teas (in flavors like matcha, mango, melon, Thai tea, lychee, etc. ), and you can also customize the sugar level and type of bubbles you want. Just when you thought you couldn’t eat any more, Koko also has substantial savory meals, and Taiwanese shaved ice, though we have never tried these selections. Koko Bakery is a solid Chinese bakery in Cleveland, and you can be assured that there will be something new to try on each visit! Cleveland is celebrating their NBA win today, so it seemed only fitting to feature a longtime Cleveland hangout on the blog. Tucked away a few blocks from the bustling atmosphere of Cleveland’s Little Italy is the serene, bohemian Algebra Tea House (2136 Murray Hill Rd Cleveland, OH). Filled with custom, natural wood furniture, textiles from around the world, and handmade ceramics, you may just think you’ve stepped into a hippie retreat on the silk road. True to its name, the specialty at Algebra is tea, and they have a bunch of esoteric blends for drinking in house (and for sale, to bring home). A small sampling of the teas on offer included: sage herbal, hibiscus, house-made chai, Darjeeling, Dragonwell, Yunnan, Assam and White Pekoe. In the international tea section there was Moroccan mint tea, Turkish tea, Palestinian tea, and a wholly new variety for us: Libyan Tea. We didn’t go in to Algebra Tea House expecting to gain a new country for our list- but we’ve never had any food or drink from Libya before – so we were really excited to see “Libyan tea” on the menu. Libyan tea is a blend of strong black tea, mint, sugar, and peanuts! Yes – the whole shelled peanuts are thrown right into the tea itself. The flavor is rich and peanut-y – and perfect as a pick me up. Along with tea, you can order house-roasted coffee made in a variety of styles, caffeine-free milk drinks, and fruit smoothies. There is also a pretty sizable menu of Middle-Eastern food, including hummus, falafel, shewarma and ful medames (Egyptian fava bean dip). While we came for the tea (and the Libyan tea was delicious) we were also pretty impressed with their falafel, which was made in our favorite herby, Palestinian/Israeli style. Between the good food, tea and relaxed atmosphere we could have stayed at Algebra for hours. We hope to visit Algebra Tea House again soon to sample more of their tea (and food!) menu. This fascinating Telegraph India article weaves the long and winding history of Chinese Chow Mein noodles in Calcutta (seen below), which was first popularized in Calcutta’s Chinatown and has now become one of the city’s most iconic and popular street foods. If you don’t have a trip to India in your future, here is a recipe for Indian-style chow mein. The name of the Hong Kong-based chain Saint’s Alp (2157 S China Place, Chicago, IL 60616) has always puzzled us – much like the steakhouse chain Ruth’s Chris, it seemed like the apostrophe was in the wrong place. But whatever the grammar, Saint’s Alp is an awesome place for a Taiwanese-style bubble tea or a savory snack in Chicago. Saint’s Alp started in Hong Kong, but has since expanded to over 40 stores worldwide, and their Chicago location was the first in the US. The Chicago Saint’s Alp relocated semi-recently to a shop in Chinatown Plaza, so it really is in the heart of it all. Truth be told – we have never gone to Saint’s Alp for the food, but we have never been steered wrong by their bubble teas. What is particularly impressive about Saint’s Alp is their massive tea selection. If you are indecisive – be warned – there is actually a book of tea varieties to flip through before you make your choice. They have more traditional green, black and oolong tea varieties along with the milk teas (which may or may not have tea in them in some cases). We especially like these dairy-or nut milk based teas, a generally popular choice, which come in varieties like Black Tea, Matcha, Almond Milk, Taro and Sesame. You can order the teas with the classic round, tapioca pearls – or boba – but there are also other more unique add-ins like “nata” coconut cream or rainbow agar jelly. Most teas are available either hot or iced, and in small or large sizes – any of which will run you less than $5. Without seeing the menu itself, it is impossible to gauge all of the varieties available, from Sumiyaki Coffee (instant coffee usually served with coconut milk) to Kumquat Lime Nectar to Iced Mint Cream Tea. There are also fresh fruit smoothies, and milkshake-like sweet drinks with yogurt or chocolate. Although there is a seating area inside Saint’s Alp, there is nothing better than taking a stroll around Chinatown and Ping Tom Park with an iced bubble tea in hand. Though if you are like me, you may want to take a look at the menu beforehand! Pastry Post-Doc: What are Chinese “German Cookies”? We were doing a search for “German cookies” in Instagram when we came across a series of photos of near-identical cookies with the same fork impressions, with Chinese captions. Come to find out that the name for these Chinese cookies, popular around Lunar New Year, is “German Cookies” (德式酥饼). German cookies require little more than potato starch (which can be found in most Asian groceries) and sugar, and you can find easy recipes at Goody Foodies and Bake for Happy Kids (seen below). As far as I can tell, they have no real association with Germany beyond the name. If anyone has any insight into their unusual name, let me know! I jumped out of a moving car to get a table at Fat Rice (2957 W. Diversey Ave, Chicago, IL ). That is how crowded the place can be get, and how legendarily hard-to-get the tables are. But at 5pm on a Wednesday we need not have worried, as we easily got a table for 2 just when walking in (we were some of the first people there, and by the time we left at 7, it was still not full). The tables at Fat Rice are communal, and the decor is simultaneously sparse and kitschy, with golden pigs, Chinese pottery and a Portuguese rooster holding pride of place. Fat Rice has received a slew of accolades, including being one of Bon Appetit’s top new restaurants in 2013. The menu features the cuisine of the former Portuguese colony of Macau, a history that lends it a unique fusion of Portuguese and Chinese cuisines. Short of taking a trip to the luxurious island, there aren’t many places to sample Macanese food. To help, the menu at Fat Rice is broken into several sections, small plates, noodles and entrees to share. There were also a rotating number of specials. The squash special – those aren’t noodles – they are ribbons of squash! We had a tough time deciding what to order, and we went with a few specials, since we hoped the other dishes would be there on our next visit! Some of the items that stood out (that we did not get) included the linguiça appetizer with ginger and olive ($8), the piri-piri chicken with spicy tomato and peanut sauce ($24) and the Malay vegetable curry with sweet potato and cashews ($16). However, when making our order, our waitress pushed us to order a vegetable dish, saying we had too many heavy foods (not sure if this was a personal thing or a management directive). In the end, she may have been right, but we were not super excited to be told multiple times we had ordered incorrectly. I think she was also a little crestfallen when we substituted vegetables for one of the more expensive meat dishes…. To start off with, we ordered a classic dish, the handmade hand-rolled rice noodles, which came either with XO sauce or mushroom and egg ($14). This was the first time we had tried XO sauce, the famous Hong Kong umami bomb, tempered with hot chilies. We absolutely loved it! At the nosy behest of the waitress, we did indeed prefer a vegetable: the special Summer Squash stir fry. The squash was cut into thin ribbons and dressed with a light sauce, tianjin (pickled cabbage) and basil. It was super light and delicious, while also being complex. Finally, we tried the special entree, the whole Branzino. This was definitely the star of the night, with an inexplicable combination of flavors: Thai lime, tamarind and cilantro. Another thing that really impressed us was the list of rare and unusual teas available, provided by the Rare Tea Cellar. We knew we had to get a pot of tea. Like wine, each of the teas had tasting notes to go along with them. We were intrigued by the “Freak of Nature Oolong” tea ($9) which boasted tasting notes of popcorn, shortbread and watermelon. The cute teapots came with unlimited refills and most cost between $5 and $10, which we felt was reasonable, because the servers do actually do come and refill the teapot. By the end of our meal, the communal tables had begun to fill up. The people at the end of the table did in fact order the signature item at Fat Rice and its namesake, arroz gordo. There is a charming little illustration depicting all of the myriad ingredients that make up one order of fat rice: prawns, squid, mussels, rice and more ($48). It looked like it took about 3 people to truly handle the dish. 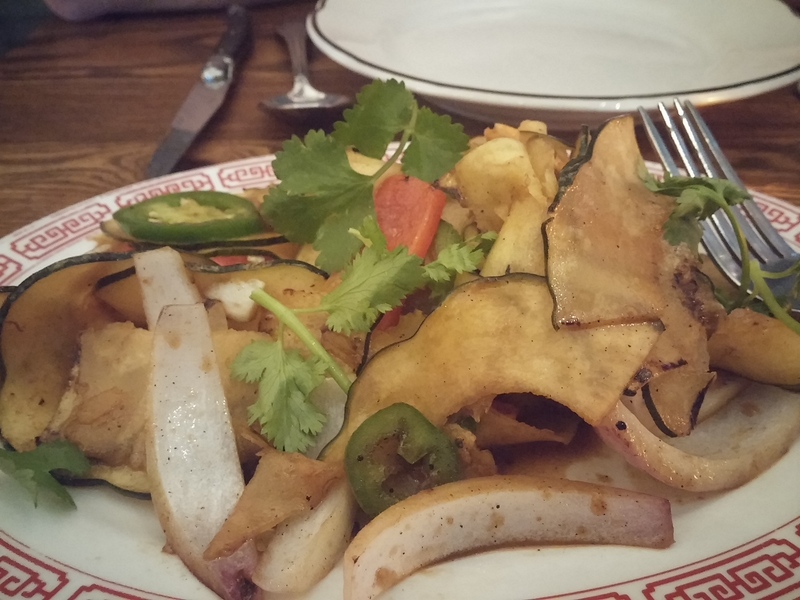 We were actually really impressed by Fat Rice, one of the recent places where we felt the hype was warranted. We are excited to try brunch, where our favorite items in the world are featured: egg tarts! I love learning about hybrid cuisines that are shaped by a convergence of languages, countries and cultures. One cultural exchange I had never considered was the influence of Mexican food and Chinese cuisine on the US border. This is not a new mash-up either, with cultural exchange going back as much as 100 years. Mexicali, Mexico, right across the US border, is home to as many as 200 Chinese restaurants. Fascinating! We were in NYC right before Chinese New Year and found ourselves hankering for some good, cheap Chinese food. Vanessa’s Dumpling House (118A Eldridge Street, New York, NY 10002) came highly recommended by my cousin, who is always in the know. When we arrived on a bone-chillingly cold day, there was already a very large line, and huge trays of Beijing-style dumplings basically flying out the door. We knew we were in the right place. The specialties of Vanessa’s are dumplings – obviously – but also an intriguing Northern-Chinese style dish – the sesame pancake. The sesame pancake was a must-have according to my cousin, and it was a completely intriguing dish to us, cooked in a giant round pan, and cut into manageable triangles. Despite the name “pancake,” this was basically a Chinese riff on focaccia bread. It had a light bread-y texture, coated with oil and topped with sesame seeds – a little greasy maybe, but totally delicious. And a slice is only $1! Yes, this place is crazy cheap. Vanessa’s takes the sesame pancake concept one further by even making sandwiches out of the sesame pancakes with fillings like beef and Peking duck ($2-3). Onto the dumplings – we ordered a mix of fried and boiled. We got the four fried pork and chive dumplings for only $1.25, eight boiled veggie dumplings, and eight boiled chicken and basil ($4 for 8). The dumplings were perfectly formed and cooked to perfection, though we slightly preferred the slightly crispy skin of the pan-fried dumplings. We also appreciated the soy and chili dipping sauces that came with each order. It was a real treat to watch the production at Vanessa’s – talk about a well oiled machine. You can also pick up some 50-packs of frozen dumplings to enjoy in the comfort of your own home ($7-14). We took our goodies to go and heartily enjoyed our little taste of Chinatown. We can’t think of a better place to get a cheap dumpling fix – and you absolutely have to try the sesame pancake. Nian Gao is traditionally steamed, and therefore has a more gelatinous texture, as in this recipe, though Chow.com also has a baked recipe. Honestly, though the baked cake may be more familiar, I really appreciate the steaming technique, which is definitely not utilized in many Western sweets. Here’s to a sweet new year! One of our formative food experiences was eating chilli crab in a hawker market in Singapore in 2010. Since it is not too common of a menu item in the US (especially in Chicago), we were delighted to find a place that offered chilli crab in our area, the oddly named Go 4 Food, (212 W 23rd St, Chicago) in Chinatown. We went there with one singular purpose in mind – Chilli crab – so this is not necessarily a review of the whole restaurant’s menu, but the chilli crab in particular. Both of the dishes came out pretty quickly and we were astounded by the veritable mountain of dungeness crab before us. The crab legs were huge: deep fried in the shell, which was a somewhat unusual preparation, and not one we had encountered before. Both of the dishes were drenched in a soupy sauce, which made it a bit difficult to actually extract the meat from the legs, even with the provided shell/nut cracker. The fusion dish was mild, with a heavily spiced (but not spicy) tamarind and turmeric flavor while the chilli crab packed some definite heat. The crab itself was sweet and tender, and as we worked out way through the dish, we would like to think we became more adept at cracking the crab legs and claws (and whatever else). We worked our way through 40+ napkins trying to do so. We really enjoyed our gluttonous crab feats at Good 4 Food, though the chilli crab we had there was not really the chilli crab we remembered from Singapore. Still, even though it is not quite what we were seeking, it was still quite delicious. We look forward to trying other dishes off the menu, especially the French-style beef which we hear is excellent. We would definitely go to Go 4 Food again, but maybe bring a bigger crowd with us. Cotton candy is always a hit, but this video made us think of it as art. For 2 minutes and 30 seconds from which you will not be able to look away, watch this amazingly talented cotton candy purveyor make some of the sugary stuff into a veritable masterpiece. Nom Wah doesn’t look like any other restaurant we have been to. Think the crazy ambiance of a 1950s diner meets corner pizza restaurant meets mah jongg parlor. The little street Nom Wah is on seems to be out of another era, and was given an especially surreal touch by a fashion-student photo shoot taking place with a model dressed in shiny spandex and vinyl while propped up against the shuttered entrance of a neighboring store. Only in NYC. We met our friends there for a Friday night dinner, and the joint was hopping. Nom Wah claims to be one of the first dim sum places in NYC, and it certainly has remained popular over the years. XLB (Shanghainese soup dumplings – above) – Try to eat these in just one bite! Scallion pancakes – These were deliciously crispy with a tasty hoisin sauce. Steamed BBQ pork bun (char siu bao) – Whoa, check out the size of these (below)! An order gets you two gigantic softball-sized bao filled with a great sticky sweet/sour pork filling and acramelized onions. Definitely give these a try. Pan Fried Noodles – Thin egg noodles stir fried with scallions, onions, bean sprouts and soy sauce. Veggie dumplings – Gluten free in a tapioca wrapper! Pork dumplings – Pork and chives in a wheat wrapper – who doesn’t like pan-fried things? Vegetarian Rice Roll – Mushrooms wrapped in a thin rice noodle wrapper with soy sauce. These are a favorite at NW, and though we thought they were slightly rubbery, they provided a good, more unique options for veggie eaters. We were also excited to see a nice and reasonably priced tea selection. We got a Shou Mei White tea and a Jasmine green tea. We were not sure how much to order, but we need not have worried. The food was more than enough to feed 5 with ease, and more to spare. The scallion pancakes, bao and dumplings were standouts. There was so much good food… it is hard to believe that it only set is back about $10 apiece! Can you believe it? Who said there was nowhere cheap to eat in NYC?